The style reached America by way of British pattern books and an ever-swelling wave of masons, carpenters, and joiners who emigrated from England. In the years immediately after the Revolutionary War. Labeled "Federal," it was enthusiastically embraced by Americans, who then adapted it to suit their own tastes and circumstances. Built-in furniture found in dining rooms and formal parlors where the fireplace wall provided space for shelved cupboards. An American version of European Neoclassicism. This type of classicism was concurrent with, and competing with the more dominant Federal style. The chief proponent of Roman Classicism was Thomas Jefferson who studied Palladio's Four Books of Architecture , especially his Villa Rotunda, when he was designing Monticello and the University of Virginia. Jefferson had been exposed to Palladio's influence in European Neoclassicism when he was ambassador to France. Examples from Buffalo architecture: None. Door and window architraves were fluted, reeded, or a combination of both, with full contour of ingenious silhouette, symmetrical upon a central axis. It was successfully terminated at the corners by inserting square blocks, which were turned or carved in bold relief. Sometimes the head-trim was of different section than that of the jamb-trim, by which means interesting variety was introduced. Frequently a long middle block in lieu of a key was substituted, this being carved in relief. Strangely enough this trim was far from Greek in derivation, but it was one of the products of the style and harmonized perfectly in its setting. During the second half of the 19th century, architects in the United States began to lose interest in Greco-Roman Classicism, and to adopt new domestic styles based loosely on medieval and other non-classical forms of building. One of the most important technological developments was the advent of balloon framing, whereby the framework of a house could be made out of uniform lumber; this was becoming increasingly available from commercial mills. Advanced manufacturing techniques were also employed to mass produce finished windows, doors,brackets and decorative turnings, often more elaborate and sometimes less expensive than their handmade counterparts. Along with plentiful building materials, there was also access to an increasing variety of publications on house building: trade catalogues, pattern books and architectural periodicals. Industrialization meant that for the first time in the United States, very large houses could be built on a wide scale. Tenements and, later, apartment houses went up in increasing numbers, as the population shifted from country to town and newly arrived foreign immigrants sought accommodation. For many, "bric-a-brac" or "gingerbread" summarize the the style. At least eight distinct architectural styles developed, along with numerous secondary styles and movements, all of which are now incorporated under the broad heading of 'Victorian." These styles overlapped in date and none had a specific beginning or end. The first post-classical styles, beginning in the 1830s, were the Gothic Revival and the Italianate. The Stick style followed in the 1860s and 1870s, and the late 19th century produced Queen Anne, Richardsonian Romanesque, Shingle and Colonial Revival styles. The first post-classical styles, beginning in the 1830s,were the Gothic Revival and the Italianate. Gothic Revival architecture came to America from England about 1830. Its most famous practitioner, English born Richard Upjohn, a cabinet maker and draftsman, arrived in this country as a young man in 1829. Upjohn's best known work is Trinity Church in New York City, consecrated in 1846. He designed St. Paul's Cathedral in Buffalo, completed in 1851. His churches, and those illustrated in publications like his Rural Architecture (1852), served as patterns for countless buildings throughout the country. Alexander Jackson Davis was the first American architect to spread the Gothic gospel. He published floor plans and three-dimensional views in his 1837 book, Rural Residences. His design for Lyndhurst, an imposing country estate in Tarrytown, New York, became a showplace for the Gothic Revival style. Davis's friend and fellow architect Andrew Jackson Downing also promoted the Gothic Revival in his books on "cottage villas" published in the 1840s. The Hudson River Valley, where Downing resided, was the perfect setting for the kind of picturesque, rambling "irregular" designs he endorsed. It was chiefly Downing's book that led to the flowering throughout rural America of some very picturesque wooden Gothic architecture. Downing's one-year partner (Downing died in a fire) was Calvert Vaux who himself published a fairly influential pattern book entitled Villas and Cottages. Six years later, Vaux moved to New York City and soon partnered with the superintendent of a new park that was being created. The park was Central Park and the superintendent was Frederick Law Olmsted. One of the architects who popularized the style was Richard Morris Hunt (1827-1895), the first American to study at the prestigious L'Ecole des Beaux Arts in Paris. Hunt was one of the architects who designed buildings for the 1893 Columbian Exposition in Chicago where the style received great publicity. French and Italian Renaissance styles are the models. The term "Romanesque" was first applied by critics in the early nineteenth century to describe the architecture of the later eleventh and the twelfth centuries, because certain architectural elements, principally the round arch, resembled those of ancient Roman architecture. Thus, the word served to distinguish Romanesque from Gothic buildings. American architects experimented with the Romanesque in the 1840s and 1850s for churches and public buildings, using round arches, corbels and historically correct features such as chevrons and lozenges borrowed from the pre-Gothic architecture of Europe. As interpreted by Richardson in the 1870s and 1880s, the Romanesque became a different, and uniquely American, style. Octagonal or eight-sided shaped structures have been built for centuries. The oldest known is the Tower of the Winds built by the Greeks about 300 BC. Centuries ago, octagon shaped buildings were popular in Italy. In 1848, Orson Squire Fowler (1809-1887), a native of the Genesee Country village of Cohocton, published A Home for All, or a New, Cheap, Convenient, and Superior Mode of Building in which he announced that the octagon house, with its eight sides, enclosed more space than a square one with equal wall space. The octagonal form had been used in public buildings in the past, but now as a concept for domestic architecture, it had a dedicated and convincing champion. Fowler's books, stressing the functional and stylistic advantages of the octagon house, found many readers and several hundred followers who sprinkled the landscape from New England to Wisconsin with eight-sided houses, barns, churches, schoolhouses, carriage houses, garden houses, smokehouses and privies. Italianate buildings in America were not built by or for Italian families. Actually, there were few Italian people in the U.S. at this time, but the idea of rural Italy was romanticized by Americans and by America's early European-educated architects. The Second Empire style was borrowed from France. It is named for the reign of Napoleon III (1852-70), who undertook a major building campaign that transformed Paris into a city of grand boulevards and monumental buildings that were copied throughout Europe and the New World. One of his most famous projects was the enlargement of the Louvre (1852-57), which brought back to popularity a roof form -- mansard -- developed by 17th-century French Renaissance architect Francois Mansart. The prototype for Second Empire style is Opera Garnier, Paris, designed by Charles Garnier. Evolving out of the Carpenter Gothic, the Stick Style flourished in the mid- and late-19th century. It reached its height of popularity with Richard Morris Hunt's houses in Newport, Rhode Island, in the 1870s. Hunt (portrait) was one of many American architects influenced by a mid-19th-century European revival of late-medieval rustic country architecture, most notably the gingerbread-ornamented chalets of the Alps and the half-timbered cottages of Normandy and Tudor England. He was exposed to Europe's architecture while studying at the most prestigious school of architecture in the Western world, L'Ecole Des Beaux Arts in Paris, the first American to do so. The asymmetrical composition of the Eastern Stick style is highlighted by functional-appearing decorative "stick work." The style is defined primarily by decorative detailing -- the characteristic multi-textured wall surfaces and roof trusses whose stickwork faintly mimics the exposed structural members of Medieval half-timbered houses. This is in contrast to earlier Gothic Revival that used the wall surface as a plane with decorative detail applied at the doors, windows, or cornices. The Eastlake Style was simply a decorative style of ornamentation found on houses of various other Victorian styles, primarily the Queen Anne and Stick styles. It is named after Charles L. Eastlake (1833-1906), an English architect who wrote "Hints on Household Taste in Furniture, Upholstery, and Other Details," published in 1868. The book was reprinted in America in 1872 and became so popular that it required six editions within eleven years. He made no furniture himself, his designs being produced by professional cabinet makers. Henry Hobson Richardson, an American architect, was one of the foremost proponents of the Eastlake style in the United States. The furniture he designed for the Woburn Public Library and the North Eastern Library in Massachusetts are very similar to pieces which appear in the illustrations to "Hints on Household Taste." As interpreted by H. H. Richardson in the 1870s and 1880s, the Romanesque became a different, and uniquely American, style. Still present were the round arches framing window and door openings, but gone were vertical silhouettes and smooth stone facings. Richardson's buildings were more horizontal and rough in texture. Heaviness was an ever-present characteristic of the style -- emphasized not only by the stone construction but also by deep window reveals, cavernous door openings and, occasionally, bands of windows. These openings were often further defined by a contrasting color or texture of stone or by short, robust columns. Richardsonian Romanesque was favored for churches, university buildings and public buildings such as railroad stations and courthouses. Consequently, towers were often part of the design. In the best examples, a single tower, massive and bold in outline, crowns the ensemble. Just as one architect was responsible for this style, one building established its popularity. Richardson's 1872 design of Trinity Church in Boston won one of the most prestigious architectural competitions of the day. Although Richardson produced fewer houses in the Romanesque style (he is also noted for his Queen Anne and Shingle Style designs), there were enough to inspire a plethora of followers. A large house, such as the Glessner House in Chicago, the Ames Gate Lodge in Massachusetts, and the Gratwick House (demolished) in Buffalo,was required to support the massive stoniness of the Romanesque style, but elements of Richardson's work -- such as broad round arches, squat columns, eyebrow dormers and carved, intertwining floral details -- found their way into the vocabulary of many local builders. Numerous masonry row houses still exist to pay tribute to Richardson's creativity and immense popularity. Dramatic semicircular arches. His arches are frequently not truly Romanesque but Syrian, an early Christian form which springs from the ground level. Unusual sculptured shapes in stone which give his structures great individuality. Following on the heels of America's Centennial celebrations, the Colonial Revival emerged in the early 1880s. The style, which borrowed heavily from early American architecture - particularly Georgian style buildings - was largely an outgrowth of a new pride in America's past and a rapidly growing Interest in historic preservation. Among the leaders of the movement were the partners at McKim, Mead and White, who had made a tour of New England's historic towns in 1878. The term "Beaux Arts" is the approximate French equivalent of "Fine Arts." The style was popularized during the 1893 Columbian Exposition in Chicago in 1893. Very influential in the US in that many of the leading late 19th century architects had been trained at Ecole des Beaux Arts, e.g., Richard Morris Hunt (the first American to study there) , H. H. Richardson (the second American to study there, but who chose to develop his own style, "Richardsonian Romanesque") and Charles McKim, John Carrere and Thomas Hastings. More than any other style (except perhaps the Chateauesque), the Beaux Arts expressed the taste and values of America's industrial barons at the turn of the century. In those pre-income tax days, great fortunes were proudly displayed in increasingly ornate and expensive houses. Broadly speaking, the term "Beaux Arts" refers to the American Renaissance period from about 1890 to 1920 and encompasses the French Renaissance, Italian Renaissance, and Neoclassical Revivals. The term "shingle style" was popularized by Vincent Scully in the 1950s. It is sometimes referred to as the "seaside style." The shingle style is basically the Queen Anne style wrapped in shingles. Like the Queen Anne style, the Shingle style was influenced initially by the work of the architect Richard Norman Shaw, but replacing his tile-hanging (PHOTO) by shingle-hanging. Henry Hobson Richardson (1836-86) is credited with developing the style and used it for most of his country and suburban houses, as did many prominent architects. The pioneer building is the Sherman House at Newport, Rhode Island, by Henry Hobson Richardson (1874). McKim, Mead & White also participated. The masterpiece is Richardson's Stoughton House at Cambridge, Massachusetts (1882-3). Half tower - 420 Linwood Ave.
Half tower - 46 Ashland Ave. The style was named and popularized by a group of 19th-century English architects led by Richard Norman Shaw. The name "Queen Anne" is rather inappropriate, for the historical precedents used by Shaw and his followers had little to do with Queen Anne or the formal Renaissance architecture that was dominant during her reign (1702-14). Instead, they borrowed most heavily from late Medieval models of the preceding Elizabethan and Jacobean eras. The half-timbered and patterned masonry American subtypes are most closely related to this work of Shaw and his colleagues in England. The spindlework and free classic subtypes are indigenous interpretations. The half-timbered Watts-Sherman house, designed by Henry Hobson Richardson, built at Newport, Rhode Island, in 1874 is generally considered to be the first American example of the style. By 1880 the style was being spread throughout the country by pattern books and the first architectural magazine, The American Architect and Building News. The expanding railroad network also helped popularize the style by making precut architectural details conveniently available through much of the nation. The early, asymmetrical Colonial Revival houses, along with other competing styles, fully supplanted the Queen Anne style after about 1910. An international style of decoration and architecture of the late 19th century and early 20th centuries, characterized particularly by the depiction of leaves and flowers in flowing, sinuous lines. The style drew on Baroque, Gothic and Moorish traditions, but was mainly unbounded by rules. Art Nouveau exploited the machine and reveled in the possibilities of decorative tiles and wrought iron. This was a deliberate attempt to put an end to imitations of past styles. In its place was a free type of architecture which integrated arts and crafts with architectural forms. The roots of Art Nouveau go back to the English Arts and Crafts Movement and William Morris. Replaced by Art Deco. France - Guimard's famous glass and iron Metro designs; the glassware of Lalique (1860-1945). Spain - Gaudi in Barcelona. The architects of Chicago were encouraged to build higher structures because of escalating land prices and the introduction of elevators. New construction materials and techniques such as steel framing and reinforced concrete allowed for more open walls, which accentuated the new materials. Metal could support such structures, and the tall building was finally developed by William Le Baron Jenney in the Home Insurance Company office building (photo) in Chicago (1883-1885). Here, for the first time, conscious use was made of novel structural possibilities. Isolated footings supported a skeleton of wrought and cast iron encased in masonry, with fireproof floors, numerous fast elevators, and gas light. The traditional masonry-bearing walls now became weather curtains or "skins," largely of glass, supported by the metal skeleton. The American skyscraper was born, although it was only with rare exceptions, as in the work of Louis Sullivan, that this original type of building was treated successfully. Louis Sullivan (1856-1924), a notable Chicago architect, developed a more detailed and influential high-rise vocabulary with classical overtones, called Sullivanesque, coinciding with his "form follows function" aesthetic. An intricate weaving of linear and geometric forms with stylized foliage in a symmetrical pattern is the unique element of the Sullivanesque style The decorative ornamentation devised by Sullivan and used on some of his office buildings is based on floral motifs but organized in a manner closely resembling the Irish interlace of the early Middle Ages. Stock replicas of Sullivan's designs manufactured by the Midland Terra Cotta Company and others gave distinction and focus to utilitarian buildings in Chicago's commercial strips and other confined areas, such as the downtown districts of smaller towns. Bungalows may be viewed in a larger context as one type of Arts and Crafts (Craftsman) architecture. Arts and Crafts architecture would never have succeeded as a design concept if it had not also met the changing needs of society. American families in the twentieth century were different from nineteenth century families and they needed a different kind of home. Daily living had evolved to a routine where men left the home to work each day, and women stayed home to care for the children. Servants, once plentiful and cheap, became too expensive for the middle class and women assumed the role of sole homemaker. At the time the lifestyles of Americans were changing, magazines like House Beautiful and Ladies' Home Journal were promoting Arts and Crafts home architectural styles to their female readers. The Prairie style and the bungalow not only appealed aesthetically to these women as the latest trend in home design, but they fit the requirement for simpler, smaller homes that could easily maintained without servants. Gustav Stickley promoted a version of the bungalow in his magazine The Craftsman. In 1916 alone, he claimed that over $20 million in Craftsman-inspired homes were built. The expanding prewar economy led to an expanding middle class in the period between 1900 and 1917. Many persons who lived in apartments were able to buy homes for the first time. They selected sites in new housing plats in cities and suburbs (which were now accessible, thanks to interurban transit). To meet the market demand of this new population of homeowners, companies began to advertise in home decorator magazines to sell house blueprints or even "redi-cut" home kits. Catalogs of blueprints and kits could be mailed cheaply to potential buyers and kits could be shipped easily via railroad cars. The catalog house was so popular that major mail-order companies that traditionally sold items like shoes, clothing, and underwear began selling homes around 1900. Sears and Roebuck of Chicago began selling building supplies in 1895 and complete house kits in 1908. Montgomery Ward, another large catalog retailer, began selling house plans in 1910 and kits in 1918. An American architectural movement based on the use of pure Roman and Greek forms, mainly in England and the U.S. in the early 19th cent. The later, more refined stage of the Beaux-Arts tradition (1890-1920) influenced the last phase (1900-1920) of the classical revival in the United States. Federal government buildings of the first half of the 20th century, e.g., the Capitol Building in Washington, D.C., owed much to the Beaux-Arts interpretation of classical design. In the late 19th and early 20th centuries, commissions for public buildings and grand houses of industrial moguls went to architects trained in the Beaux-Arts tradition. These architects generally produced academic designs based on classical or Renaissance precedents. A general term, rather than a specific architectural style. Period houses were revivals of earlier historical styles, and, although they were more accurate historically than 19th century revivals, they also reflected some modern tastes. Ornament tends to be underscaled and carefully executed. Fine effects are achieved through the handling of quality materials for color and texture --- shingle or slate roofs with a weathered, hand-crafted appearance; dark stained "hand-hewn" oak lintels; tapestry brick laid to create a richly textured surface. The success of the period house depended on its stylistic accuracy. Earlier architects could, in their Queen Anne and contemporary designs, pick bits and pieces from various earlier periods. Now, architects had to become architectural historians in order to successfully suggest a specific earlier period. Most architectural offices had a library with the White Pine Series or books on English parish churches or farm houses in Normandy. The former, a magazine that began as an advertisement series for white pine lumber and developed into a useful reference work, assisted in promulgating the revival of early American architecture by the Historic American Buildings Survey (HABS), which began its recording activities in 1933. The first HABS drawings were produced by architects, and the fact that so many of their sheets resemble actual working drawings reflected not only their training, but also their intention that the drawings be used in constructing new houses based on earlier precedents. The majority of models for period houses were farm or rural structures: English cottages, Spanish haciendas or New England farmhouses. Frequently built on large, newly plotted suburban lots and incorporating many contemporary ideas of interior arrangement and planning, typical period houses were far more spacious than earlier revival structures. Like Shingle Style and Prairie School houses, period houses had an intimate relationship with the landscape. Often sprawling across the width of a lot, period houses had two yard areas, a formal front and an informal back yard. Rarely did a period house not have a rear terrace, porch or patio. Churches: The period house was not an isolated phenomenon. Many churches built at the same time boasted details and proportions taken directly from examples built centuries before, either in America or in Europe. The interiors of both period and country houses had fewer rooms than their 19th-century predecessors, but the rooms were much larger and space flowed more freely Often, especially in smaller period houses, the dining room was replaced by a dining area at one end of an oversized living room - an arrangement reflecting both the open planning and the more informal lifestyle of the times. Although derived from historical precedent, the period house was a distinctive architectural development that was basically American. And, although the full flowering of the style occurred several decades ago, mutants of the species can be found today along the curving streets of almost any suburban development. In Europe, the dominant style of architecture during the 18th century is known as "Neoclassical." In Great Britain, the parallel term is "Georgian," named after the reigns of the three King Georges from 1714 to 1820, but commonly not including George IV. In Britain, in the first half of the 18th century, the ideals of Andrea Palladio (1508-80) were dominant. In the second half of the century, Roman precedents (inspired by archeological discoveries in Pompeii and Herculaneum) were popularized by Robert Adam (1728-1792). See, for example, Adam's Portland Place, in London, and Charlotte Square, in Edinburgh. In the U. S., Neoclassicism is referred to as "Colonial" (until the Revolution), and then "Federal." In New England, the English Georgian style came to America by way of British pattern books and an ever-swelling wave of masons, carpenters, and joiners who emigrated from England. In New England, Colonial architecture is also referred to as "Georgian." "Georgian Revival" is sometimes referred to as "Colonial Revival" (1870-1920). The English Georgian style was the most prevalent type of Colonial buildings, but certainly not the only one. Two obvious exceptions are styles that were used by the Dutch and French. Early examples of Colonial Revival were rarely historically correct copies but were instead free interpretations with details inspired by colonial precedents. During the first decade of this century, Colonial Revival fashion shifted toward carefully researched copies with more correct proportions and details. This was encouraged by new methods of printing that permitted wide dissemination of photographs in books and periodicals. In 1898 The American Architect and Building News began an extensive series called "The Georgian Period: Being photographs and measured drawings of Colonial Work with text." This was joined in 1915 by the White Pine Series of Architectural Monographs, which was dominated by photographs of colonial buildings. These and similar ventures led to a wide understanding of the prototypes on which the Revival was based. Colonial Revival houses built in the years between 1915 and 193 5 reflect these influences by more closely resembling early prototypes than did those built earlier or later. Prairie houses (1905-1915) may be viewed in a larger context as one type of Arts and Crafts ("Craftsman") style architecture. The prairie house is one of the few indigenous American styles. The name is key to the style. The stereotypical image of the Midwest prairie is that of a wide, flat, horizontal, treeless expanse that meets the horizon. To translate this scene into architecture, Wright designed a horizontal building that was low to the ground. Wright himself claimed that the interior of the prairie house held the greatest significance. With his "open plan" (minimum number of separating walls on the first floor) he sought to "beat the box," to escape the Victorian compartmentalization which he claimed was stifling the American family. The archetypal vision of the Victorian home, with mother entertaining the ladies over tea in the parlor, the father smoking cigars in the study, and the children banished to the nursery upstairs, was Wright's nemesis. To avoid this subdivision of space, Wright did away with the conventional divisions between spaces on the lower floors of his prairie homes. Rather than setting rooms in the house apart in its space and function, he unified them into one common space (Martin House example). The style originated in Chicago and landmark examples are concentrated in that city's early 20th-century suburbs, particularly Oak Park and River Forest. Many of the architects in the Prairie School worked with Wright himself or with his earlier employer and teacher, Louis Sullivan. Others absorbed Wright's and Sullivan's influence simply by being in Chicago Among the most important were George W. Maher, Robert C. Spencer, Jr., Thomas E. Tallmadge, John S. Bergen, Vernon S. Watson, Charles E. White, Jr., Eben E. Roberts, Walter Burley Griffin, William Drummond, F. Barry Byrne, George E. Elmslie, and William G. Purcell. The style in its vernacular form was spread throughout the country by pattern books published in the Midwest. Buffalo boasts the Darwin Martin House - Wright's best Prairie House, as well as four others. In 19th century England, the Arts and Crafts movement was an outraged response to the Industrial Revolution, which was threatening time-honored manual crafts with extinction. The movement was also one of social and political reform. Ruskin was not an architect, but as writer (Seven Lamps of Architecture, 1849, and The Stones of Venice, 1851-53) he influenced the return from Neoclassicism to the earlier Gothic style. William Morris (1834-96) was an English poet, artist, and socialist reformer, who rejected the opulence on the Victorian era and urged a return to medieval traditions of design, craftsmanship, and community. He and some friends established a firm in 1861 to manufacture wallpaper, stained glass, chintzes, and later also carpets, tapestries, and woven furnishing materials. In America, the Arts and Crafts movement, 1890-1920 -- often referred to as the Craftsman movement -- expressed dissatisfaction that industrialization had failed to provide a decent environment for working people and at the same time resulted in shoddy mass-produced goods. It encouraged simple honest design with a regard for the integrity of the material employed. Northeast: Gustav Stickley created the first truly American furniture, known throughout the world as Craftsman. A hardworking, dedicated man, Stickley achieved success in the early 1900s as the leader of the Arts & Crafts Movement in America. After a trip to England in 1898 Stickley was inspired by British reformers, John Ruskin and William Morris, to create a new line of handcrafted furniture based on honesty and simplicity. Northeast:Elbert Hubbard (1856-1915 visited England and met William Morris. He was inspired to start an Arts & Crafts community -- which he called Roycroft -- in East Aurora. Hipped roof - 310 Depew Ave. The Tudor monarchs in England were Henry VII, VIII, Edward VI, Mary and Elizabeth, from 1485-1603. However, Tudor Revival is derived primarily from English Renaissance buildings of the 16th and early 17th centuries, including those of Elizabethan (Elizabeth I, 1558-1603) and Jacobean (James I, 1603-25) periods. The period 1910-1930 was a time of free borrowing of historic styles as more people could afford single-family houses and there was no real consensus about a modern architectural style. Houses in this period are sometimes lumped together as "period revival." Tudor Revival was enormously popular in the 1920s and 1930s, especially in the suburbs, where only the Colonial Revival rivaled it in popularity. Modified versions became fashionable in the 1970s and 1980s. Sometimes Tudor Revival is referred to as "Elizabethan" or "Half-timbered" houses. A "half-timbered" building has exposed wood framing. The spaces between the wooden timbers are filled with plaster, brick, or stone. Stucco - 57 Nottingham Terr. Stucco - 295 Depew Ave. Doors: "Tudor" arch: 4-centered in form of shallow arch that rises to a central point. International style is a style of architecture applied to residences and public buildings that is minimalist in concept, is devoid of regional characteristics, stresses functionalism, and rejects all nonessential decorative elements; typically this style emphasizes the horizontal aspects of a building. It developed during the 1920s and 1930s, in western Europe principally in the Bauhaus school under Walter Gropius (1883-1969), and in America particularly as a result of a highly successful exhibit at the Museum of Modern Art in New York City entitled International Style in 1932 and a book entitled The International Style--Architecture since 1922, by Henry-Russell Hitchcock (1903-1987) and Philip Johnson (1906- ). Houses: In the decades separating World Wars I and II, Americans tended to prefer period houses that reflected past traditions, while European architects emphasized radically new designs that came to be known as International style architecture. Le Corbusier had stressed the idea of the house as a "machine for living." During the 1930s these ideas were introduced into the United States by several distinguished practitioners, like Walter Gropius and Mies van der Rohe, Richard Neutra and Marcel Breurer who emigrated to escape the developing chaos in Europe. International Revival: A term occasionally used to to describe a 1970s adaptation of the International style. The name Art Deco comes from the 1925 Exposition Internationale des Arts Decoratifs Industriels et Modernes, held in Paris, which celebrated living in the modern world. The style began in France but America became the center of the artistic movement. 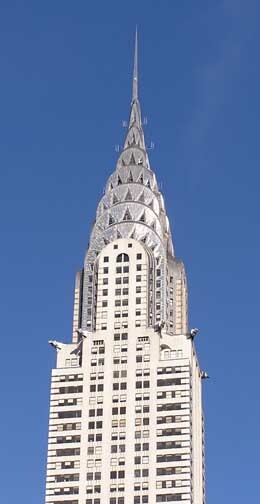 Art Deco was the first widely popular style in the United States to break with the revivalist tradition (see, for example, Gothic Revival or Greek Revival or Italianate). 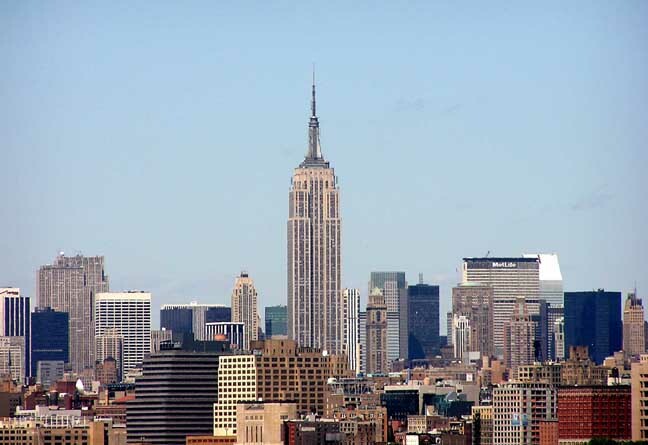 The largest concentration of Art Deco buildings is in New York City and Miami. Low relief geometrical designs, often in the form of parallel straight lines, zigzags, chevrons, and stylized floral motifs. Architectural style found principally in buildings constructed in the 1930s following the earlier Art Deco. One influence was the beginning of streamlined industrial design for ships, airplanes, and automobiles. The smooth surfaces, curved corners, and horizontal emphasis of the Art Moderne style all give the feeling that airstreams could move smoothly over them; thus they were streamlined. 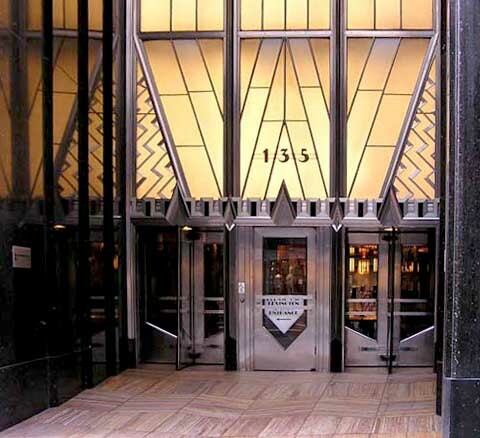 Moderne was eclipsed by the International style after World War II. Sometimes Moderne (or Art Moderne) is identified with Art Deco. Although somewhat different in their overall appearance, both styles share stripped down forms and geometric-based ornament. The Art Moderne style has a distinctive streamlined or wind-tunnel look. The streamlined effect is emphasized by the use of curved window glass that wraps around corners.